There are a couple different USB to serial adapters that you might use as a network engineer. The one pictured in the article is manufactured by Prolific, but sold by multiple different vendors. There’s also another manufactured by FTDI, which I’ve heard good things about, and of course the one built into recent Cisco hardware. The driver for the chip used by Cisco is conveniently included in OS X, but the FTDI and Prolific chips require their own drivers. Myself, I have used the Prolific cables for years and have been generally happy with them. The best drivers for the Prolific come directly from the manufacturer, not the vendors that resell them. This is because the vendor provided drivers always seem to be out of date. However, the drivers from Prolific don’t work with all cables out of the box. I’m going to show you how to fix that. If you are running OS X Yosemite, you may need to read this article to get the driver working: OS X Yosemite and Prolific USB Drivers. Watch for the Manufacturer (circled in blue). Then note the Product ID and Vendor ID (circled in red). We will be adding these to the driver. We need to convert the hex numbers to decimal. An easy way to do that is to run Calculator and hit Command-3. Click the “16” above the clear button to switch to hex and enter the number you want to convert (like 0x2008 from the example). Now click the 10 and you have the hex to decimal conversion. 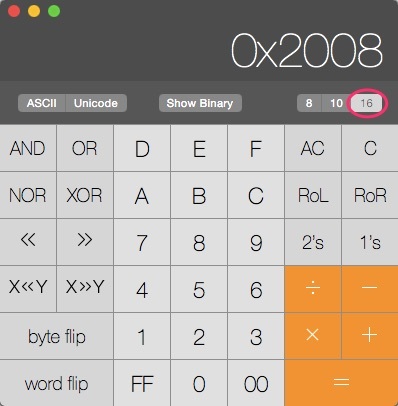 If you used 0x2008, you should get 8200. You need to convert both the product and vendor IDs. At this point, you will need to either fire off a root shell or sudo everything. Safety First! Backup your Info.plist so you can fix the driver if you break it. You should now have a working USB device! This is a bit of a hassle. I recently found another way to solve this problem, but it’s not free and it’s another blog post. This entry was posted in Tools and tagged Apple, tools by scottm32768. Bookmark the permalink. You seem to be confusing hexadecimal and octal. 16 is hex. Good grief. Thank you for pointing that out. It’s been fixed. Hi There. Thanks so much for working on this issue. After following your instructions, my available port appears as tty.OffRoad-PL2303-00001014. Is this correct? I seem to be able to transmit (indicated by the orange LED on the adapter, but am receiving nothing back from my device. Any thoughts? I too seem to have the same problem with the driver sending, but not receiving. 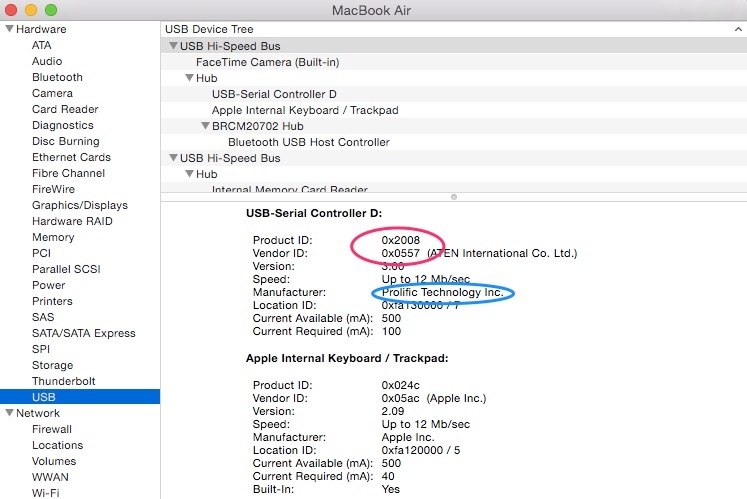 Am using the ATEN UC232A on OS X 10.10.3, and /dev/cu.usbserial and /dev/tty.usbserial are being created just fine. That said, I can open Fedora in a Parallels VM and it will work once I give it control of the device. It’s a good workaround, but using it natively under OS X is preferred. Not working here. Kext not privileged. Two days workaround failed for me. Come back to Manhattam serial converter. Sorry, where do you get 0x2478 ? When i see your vendor id 0x0557 ? I think he is saying the original driver was for a cable with vendor ID 0x0557, but now he has a cable with the same Prolific chip from a different vendor (Tripplite). 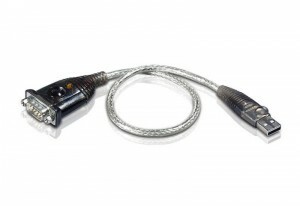 The same driver should work, but the new cable has a different vendor ID. He is adding a section to Info.plist to allow the new cable to use the driver. Am I right? This may be a dumb question, but in step 5 don’t you want to do kextunload BEFORE kextload? Please correct me if I’m wrong. Unable to stage kext (/Library/Extensions/ProlificUsbSerial.kext) to secure location.